The birthplace of Minneapolis on the Mississippi River at St. Anthony Falls is also the best place to take a walk or bike. This view is from the Mill City Museum. A couple friends from Omaha told me recently that, for more than a decade, all they saw when visiting Minneapolis/St. Paul was the Mall of America and one stadium or another. Granted, a lot of attractions vie for attention in Minnesota’s Twin Cities. Visitors can be forgiven steering toward sports, concerts, and shopping, then finding the nearest entrance to the homeward bound interstate highway. We call Minneapolis our home town, but this was a hosted visit to the city. So, while we got to see what’s changed over the last seven years while we’ve been away, we also got to see the city through the eyes of a few other travel writers. Here’s the takeaway, keeping in mind how a new visitor might approach our fair city. Minnesotans famously embrace the outdoors at all times of year. So, the best place to start a visit is by getting out and walking. If it’s cold, wear a hat. Downtown Minneapolis sits on the west side of the Mississippi River, which angles southeast to the University of Minnesota campus and eventually to St. Paul. The original settlement was on the east side of the river at St. Anthony Falls. 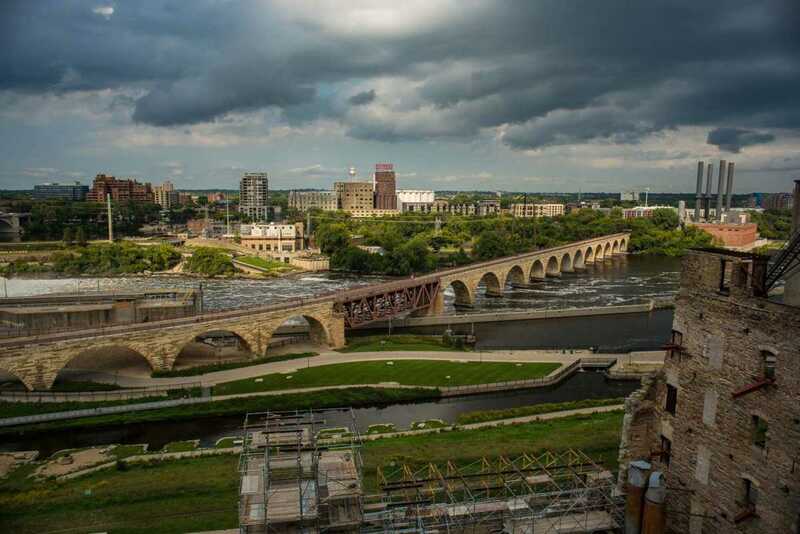 We suggest a walk across the Hennepin Avenue Bridge (site of the original bridge crossing), then down along the east bank on Main Street, with a stop at one of the restaurants in St. Anthony Main, then returning downtown across the picturesque Stone Arch Bridge. You could easily do this on bike, too, using Nice Ride bikes. While not as popular in summer as circling Minneapolis’ lakes, this Mississippi bridge route, part of the Great River Road National Scenic Byway, is great for residents and visitors. You’ll get some nice views of the skyline, see the remnants of St. Anthony Falls, and catch glimpses of Minneapolis’ old mill district. 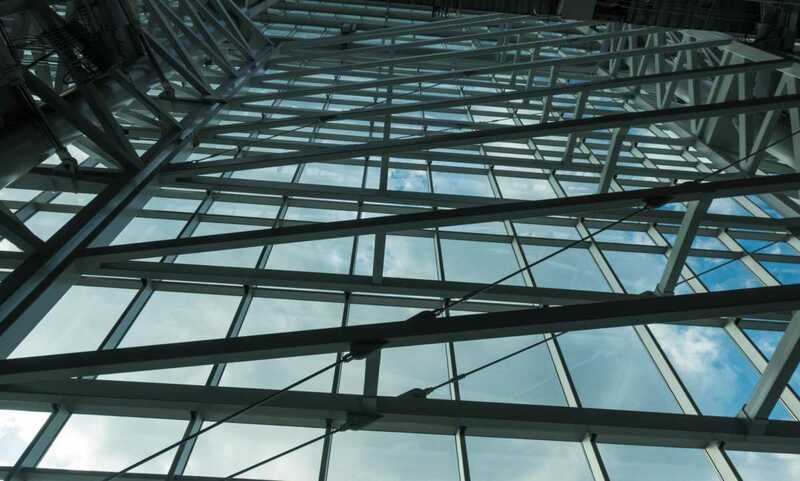 The IDS Crystal Court on Nicollet Mall is at the intersection of a bunch of skyways, for your indoor comfort. From the AC Marriott Hotel, we walked to nearly every meal and attraction over three days. Our walks inevitably passed along Nicollet Mall, the historic central shopping street of downtown Minneapolis. The Mall is undergoing another major overhaul, so it’s hard to say what impression it and the IDS Crystal Court–a focal point of the skyway system–currently have on visitors. Nicollet Mall and the skyways are supposed to be pedestrian friendly. But downtown has always struggled to balance bus routes with pedestrian ways, and skyway businesses with street-level retail. 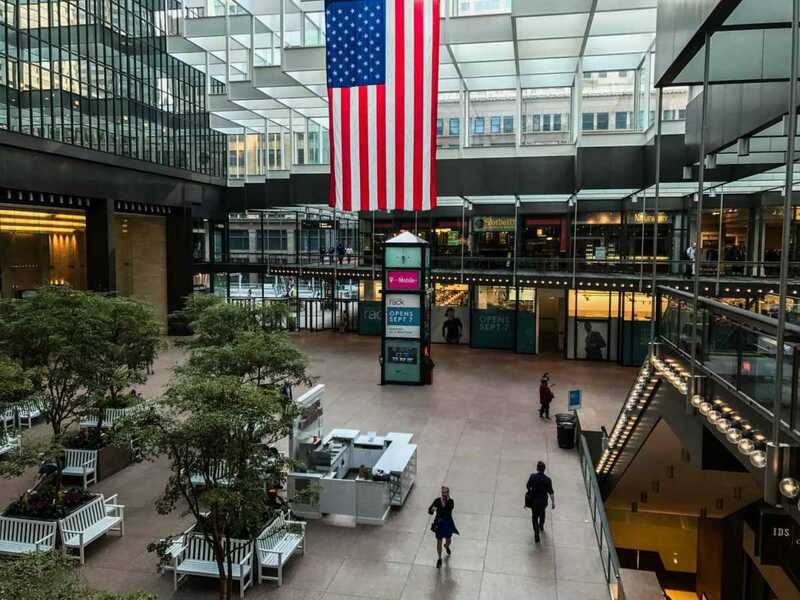 While both the original Nicollet Mall and the skyway system were groundbreaking urban features, they present constant challenges to the downtown experience. Fellow travel writers described downtown feeling a little empty, even on a weekday morning. Downtown’s retail core is re-emerging, this time stoked with off-price retailers. Saks Off 5th, Nordstrom Rack, Marshall’s, and Target’s flagship store are mainstays on the new Nicollet, with a few more retailers in the Crystal Court and Gaviidae Commons (neither of which are the shopping hubs they once were). For a taste of local boutiques, you’ll need to venture a few blocks upriver to the North Warehouse District. At the other end of Nicollet’s 12-block stretch, retail gives way to restaurants and then ends at Orchestra Hall and Peavey Plaza. We hope the Plaza and the reinvented Nicollet Mall offer good meeting spots, places to sit, and the seasonal color of farmers’ markets and festive events. 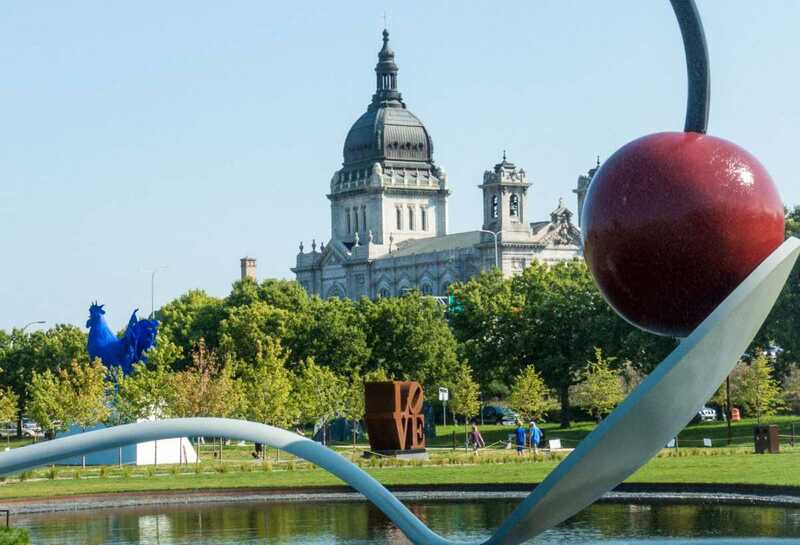 It’s time to revisit the Minneapolis Sculpture Garden and Walker Art Center. Latest renovations were just completed in 2017. More walking is in order to enjoy some of the architectural and art highlights of downtown Minneapolis. Here’s our list of recommended stops, starting from the Stone Arch Bridge and working your way west to Walker Art Center. A great little history museum that tells the story of the flour mills and Minneapolis’ place in the country’s immense agriculture and food industries. The Guthrie, founded in 1963, moved to the riverfront in 2006. Whether you go to a play or not (chances are good something will be running on one of the three stages) plan to visit the building. The Yellow Box and the Bridge to Nowhere are thrilling features, and the lobby environs may just draw you into a longer stay. Architectural and backstage tours are available. It’s big and ugly from the outside, but I was duly impressed with the interior spaces, the light, and the creature comforts of Minneapolis’ newest stadium. You can take a tour, or you can consider visiting during other public events, like high school football tournaments, home shows, or Monster Jams. Besides the upcoming Super Bowl LII, the stadium is all set to host the 2018 X Games. 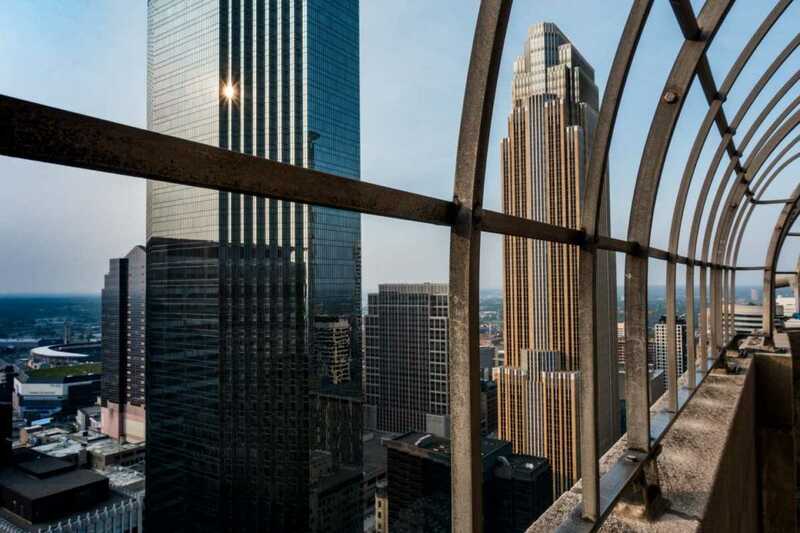 From the observation deck of the historic Foshay Tower. The classic 1929 ‘skyscraper’ was the tallest building in Minneapolis until 1972. It’s still the classiest. Do enter the lobby to see the elevator doors, or check in with the W Hotel for more access to the observation deck and a sweet little museum about the fate of Mr. Wilbur Foshay. Plan to refresh yourself at Prohibition Bar on the 27th floor. Minnesota Orchestra’s home was built in 1974 and renovated in 2013. The outdoor event space adjacent to Orchestra Hall, Peavey Plaza, is being updated again, too. We’ll see how it ties into the new Nicollet Mall scheme. Originally created in 1988, the renovated garden reopened earlier this year. You could call it a hidden secret of Minneapolis if it weren’t right out in the open. To walk amongst the creations and spaces is to discover something personal and public at the same time. We like the combination of surreal and abstract sculptures with traditional anthropomorphic works. Think of the Sculpture Garden as a giant welcome mat for Walker Art Center, which is now capping off its latest renovations, not to be confused with the 2005 addition of a new building. 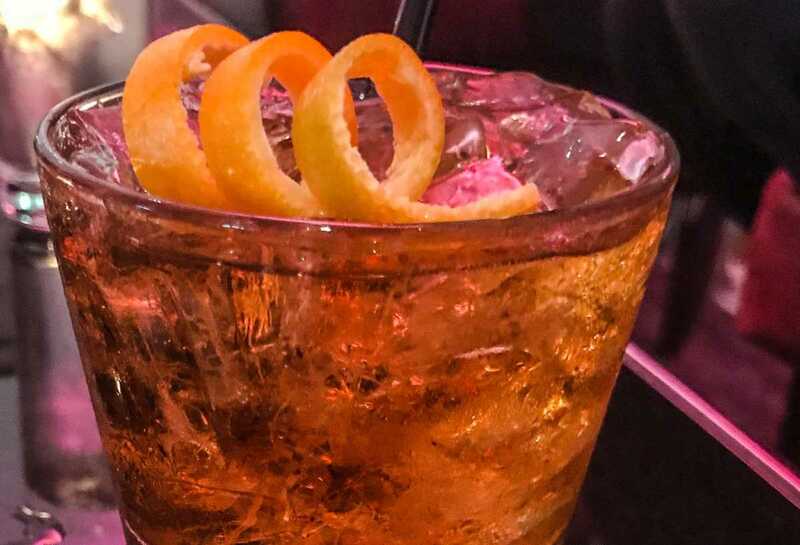 A classic Manhattan cocktail at Prohibition Bar, located on the upper floors of the Foshay Tower, built in the 1920s. Without ever needing to hop in a car, we ate three meals a day in downtown Minneapolis. You can’t go wrong eating breakfast at either Key’s (in the Foshay building) or Hell’s Kitchen, popular day and night. For lunch, we sampled from the dozen or so food trucks parked along Second Avenue South. And at dinnertime, we got a taste of everything, from the ultimate steakhouse experience at Manny’s (by the successful decades-old Minneapolis holding company, Parasole) to the sustainable seafood offerings at Sea Change (menu originally conceived by James Beard award winner Chef Tim McKee, a long-time favorite of ours), to the innovative preparations and wine pairings of Monello (new to us, but associated with the popular Burough restaurant in the warehouse district). With every meal, I knew I was sampling slices of Minneapolis culinary history: past, present and future. This giant door of USBank Stadium opens toward the downtown skyline. Within minutes, the building can be converted to semi open air. One big advantage staying Downtown Minneapolis is that from this area you can get anywhere. The AC Hotel is just one block from a Light Rail stop: the Blue Line goes to Mall of America, and Green takes you to St. Paul. Nice Ride bike stations are readily available, and the Meet Minneapolis Visitor Center on Nicollet at 5th Street is well equipped to offer advice on getting to Uptown and the lakes via city bus. Of course Uber and Lyft drivers are just minutes away. Sometimes it’s best to play the tourist in your own hometown to appreciate what’s in front of you. We loved being led around Minneapolis and given the chance to see it with fresh eyes. Our Minneapolis ‘trip’ reminded us of why we prefer to stay in city centers wherever we travel, all the better to discover the heartbeat and history of the place. Note: Thanks to the AC Hotel Minneapolis for a lovely stay. We discovered this hotel group (now under the Marriott unbrella) was started by Spaniard Antonio Catalan. It felt immediately familiar, in an international sort of way: a sleek Euro design, plentiful work and luggage surfaces in the room, delicately infused gin and tonics at the bar (! ), good breakfast options, and a relaxed Midwestern lobby. Sports fans and theater goers can mingle here. Our stay was also sponsored by Meet Minneapolis and the participating restaurants. Have a look at many more ideas of what to do in Minneapolis and Saint Paul here. Minneapolis is an 8-hour drive from my home city of Winnipeg, Manitoba and a favourite destination for many Manitobans. These days, I think many do stay near the Mall of America, but I remember some lovely visits when I stayed downtown. I’ve seen some of the sites you’ve listed here, but not all. It might be time for another visit. Hope so, Donna, and I hope I’m in town to welcome you. My last visit to Winnipeg was as a kid, so I KNOW I’m due for a trip north. I hear good things about the Human Rights Museum and the city in general these days. Can’t wait to see more of Minneapolis. I was there for a day, driving around with a friend from Duluth and so enjoyed the architecture, the river and views. Like Donna, I’ve been to Minneapolis many times on day trips from Manitoba. It’s been far too long since my last visit. Would love to go back and see the updates to the Sculpture Garden. I think we could find some good eats together, too, if we put our heads together. I’ve never been to Minneapolis and am planning a visit in the next year or two, so I really appreciated your insight into the town’s offerings. I’ll definitely visit the sculpture garden. Please let me know when your plans are coming together. I’d love to give you other recommendations–and meet up with you, too, if I’m in town. I’d never really thought of Minneapolis as a place to visit, but it looks as if there is loads to see and do there. I’d love to visit the sculpture garden, or walk over some of the bridges. Haha, I guess that’s why the Twin Cities are also referred to as ‘fly-over’ land. Locals take pride in our being out of the way. Do come visit!